Low on the northern horizon, a faint white light forming. Even as the night unfolds, this light forms. Amid myriad stars. There is no moon. Pleiades dance in the east, seven—I count seven. Black except there, on the northern horizon, low: faint white light gathers itself. “Now it ripples, now it murmurs, ripples, it sighs, hums” (Quiche Maya, “Popol Vuh”). Constellations wheel slowly, night sinks into darkness. The light grows, glows brighter, sending silent fingers arching across the sky to the very dome of heaven. Then—ripples. Huge cosmic ripples. 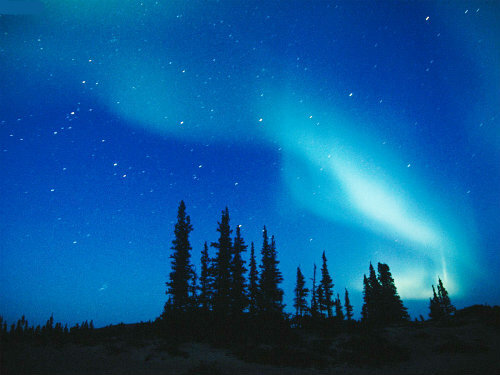 The aurora comes alive, flowing into the vault of heaven, sending long jets, volleys of light. Rippling, discharging, immense. White, green, some red. Half the night a shimmering tissue of light—jets, streams of cosmic matter. All this above this mountain pond this autumn night. Loons call—a rippling. Barred owls growl and scream, echoing strangely through spruce forests. This autumn night I witness creation again. I remember my first time, in far northern Maine. It was Thanksgiving Eve and I gave thanks for this stunning wonder of nature spread out above the rolling fields and hills. That night, Aurora was yellow and green. I remember my best time, right here at my home in the mountains of western Maine. Autumn, again–the night cold and bracing. I couldn’t make myself go inside. I stood on the lawn, head tipped back, mesmerized by the light show. Orange and red, yellow and green reaching up over those ancient peaks. Electric, moving…a dance of light. I called everyone I knew to force them from their TV’s and their computers …and before long friends and family, dozens of miles apart, were sharing that magnificent spectacle. Thank you for reminding me of those moments of awe. One reason is to add whatever we have to the storehouse of positive human knowledge. Beautiful, Thank you for your words and picture, Calvin Luther Martin, I have seen it here in South Australia twice in the time I been here, all the reds, pinks and blue,of the night Skye Southern Aurora hanging from the havens like a big Curtin.